The Sailor's Return, Francis Wheatley, 1786, National Maritime Museum. As I've posted before, the sailor returning to loved ones is a well established trope in the eighteenth century. In this image, the sailor carries his gold in his round hat, much to the delighted astonishment of the young lady who comforts a sick man. 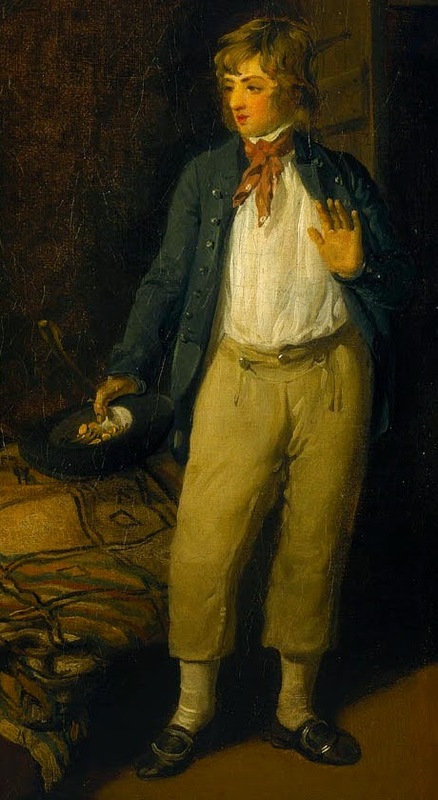 This is a popular image for slop clothes, as it is detailed and typical of other depictions of sailors' attire. The sailor's neckcloth is the familiar orange/red, but spotted with white. His white shirt is so thin that you can see a bit of his skin beneath! Translucence in eighteenth century art is a topic entirely of its own, and this may not be intended as a true representation of the material in sailor's shirts. Once more, we have a sailor who has neglected a waistcoat. The lack of a waistcoat on sailors is far more common than I would have guessed going in to this project. Though the National Maritime Museum states that his jacket buttons are brass, I'm not so sure. They appear to be the same color as the blue jacket, but they also appear to be reflecting light. Perhaps they buttons are of a death's head style, and woven with a more expensive thread. It's a tough call, and I'm not sure I'd put a solid conclusion to it. What we can say about the jacket is that it is double breasted with slash cuffs and unlined. His trousers are of a broad fall style, and a beige color. The trouser buttons here are undeniably metal, though whether it is a white or yellow metal isn't obvious. The trousers are very short and end right at the bottom of the calf. His stockings are white, his shoes with a very slight point at the toe, and preposterously large white metal oval shaped buckles. In his left hand, our jack holds his black round hat, with its brim bound in black tape. Because he holds it out for us to see the gold coins, we can also see the white lining of the hat, a detail usually invisible in contemporary images. In the same hand, he holds his stick. 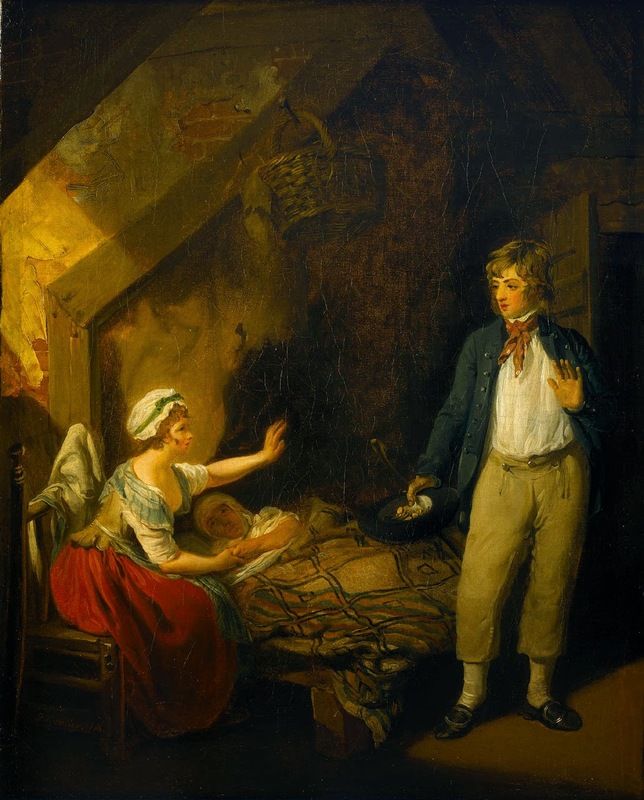 There's a lot more in this image beside our sailor: the odd pattern of the blanket, the nail on which the basket hangs above, and the visible stays on the woman are all wonderful little tidbits of daily life that are often under represented in extant eighteenth century art.